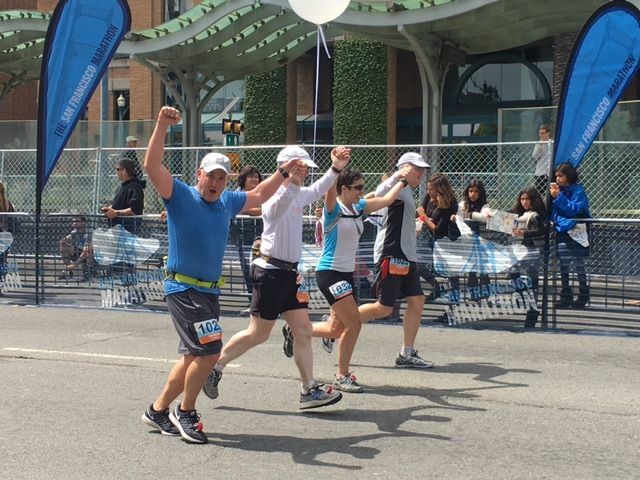 SF Double Marathon – So nice, we did it twice! SF Double Marathon in the books – 52.4 miles through San Francisco this weekend. This ultra was a fundraiser for Family Assistance Ministries. Together, we raised $1,500. Thanks everyone who generously donated. This was a fun race – it runs the SF Marathon course in reverse, starting at midnight. After the first lap, you wait until the main marathon starts, then jump in with all the marathon + half runners. It was such a cool way to see a city that I love – twice! The SF Ultra runners met up at a tent near the Ferry Building around 11pm to stash drop bags and get ready for the race. I’d tried to get a few hours of sleep before, with mixed success – going to sleep at 4pm is not a thing that happens often. 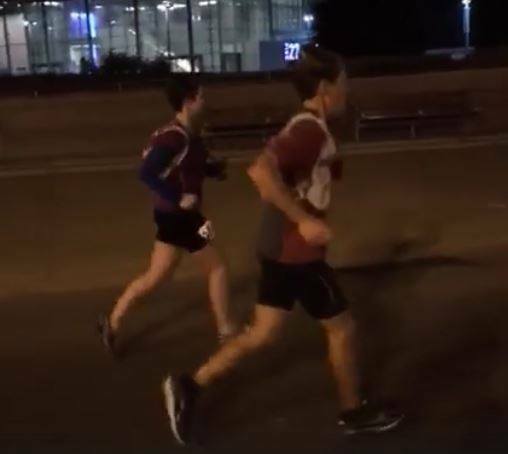 At around midnight, with little fanfare, we all took off from the Ferry Building and headed south, starting with the last few miles of the marathon course. The ultra course is not a closed course on the first lap, which means that roads are free for cars to drive on, and the course markings are … pretty non-existent. At a couple of intersections, there were suspiciously placed orange cones – some had arrows, and some didn’t – that theoretically signaled the route. It was a bit of an adventure to stay on track, but also a fun way to test our knowledge of the city. Runners split into a couple of groups fairly quickly, mainly for the purposes of making sure we were staying on the course. I ran with the “lead pack” for the first loop – this was a group of talented and intrepid runners, some of whom had run the course before. We [mostly] didn’t get lost! One of the highlights of the race was running through the Dogpatch at night. The city is mostly empty at this time of night, but we did pass by a few bars with folks hanging out just outside of them. They were confused, incredulous, then excited to see us once they figured out what we were doing, and we got some impromptu encouragement along the way. Towards the end of the first lap, once I knew the way to the start/finish line, I let the fast runners go ahead. 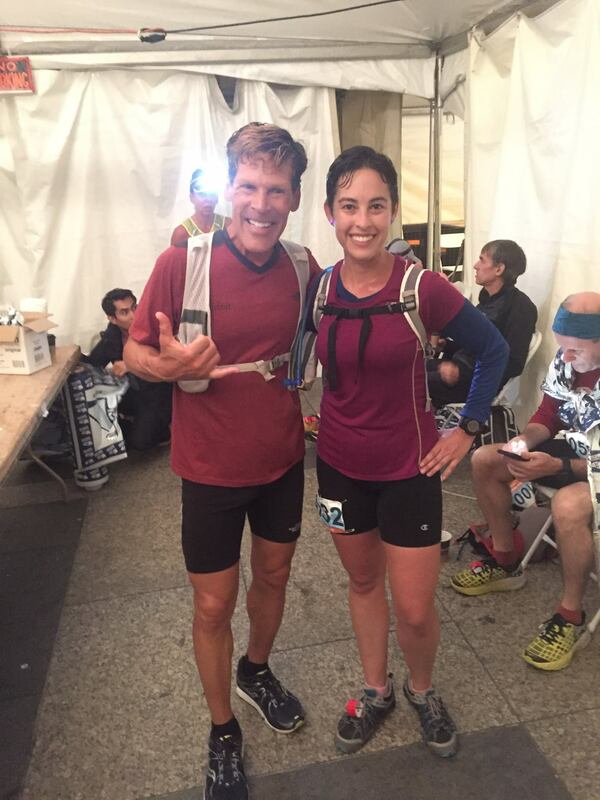 Dean Karnazes, famous ultrarunner, was also running the race – I met him about ten years as a journalist at UCSC, when I could barely run 3 miles. He caught up to me on this stretch, and I got to finish the first loop with him! You can check out the video of us running together here. We weren’t allowed to start the second lap before the actual marathon started, so I hung out in the tent for quite some time. I was super cold – sweat was drying, and it was like 4:30am, so it was chilly outside. 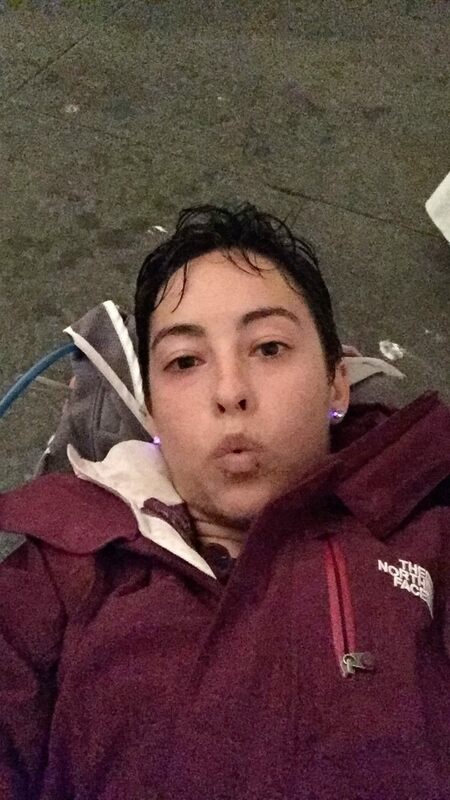 I layered on my winter parka and took a nap in between loops. Luxury! I signed up for this race originally because Mike W, who got me into running originally, said he was signing up. His brothers Pat (who I crewed Badwater with for Mike), and their brother Chris were also running. This was Chris’s very first ultramarathon! I ran the second lap with these guys – Mike and I divided up and paced Chris and Pat, who had varying speeds for this part of the race. Crossing the Golden Gate bridge was particularly challenging due to how many people there were, and there were a lot of hills that seemed much harder running in reverse. The second lap was a little psychologically confusing too. Usually, late in an ultra, runners spread out – you don’t see nearly as many folks. The opposite was true for this race – suddenly, there were thousands of people to run with! The vibe was totally different, too – instead of all runners wanting to talk to each other and run together, which happens in ultras, marathoners tend to keep their heads down and focus on their own race. So, it was like being in a sea of really busy and dedicated people. The four of us finished the second loop together – a fun way to end an awesome race. I hope to get to run this race again one day. I really enjoyed it this time – such a unique experience. It’s a way to experience a popular marathon different than the traditional approach, and it’s a really neat opportunity to to see San Francisco from a different perspective.